Two blog posts in one week. I know.... right?! You must be wondering how this is possible. Firstly because I am forcing myself to take a break from my book series for a day. Not sure if I'll make it the whole day, but I'm trying. Also, it is snowing outside. I want to go to Victoria's Secret to utilize my gift card from Christmas during their semi-annual sale, and I'm hoping the snow will let up soon. I may end up going while it is snowing anyway. Snow can't keep me from new undies! 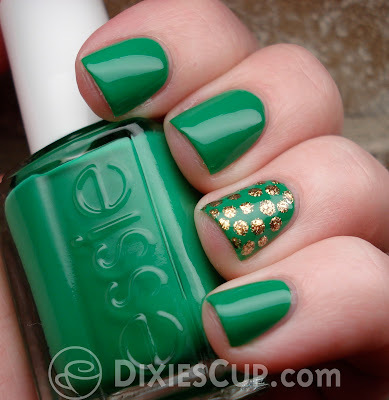 Today I'm sharing a not-so-new Essie polish with you. This polish was released in a collection in 2010. I've been wanting it since the first time I saw it on one of the nail blogs I read, but only recently got my paws on it. I found it at my local ULTA. 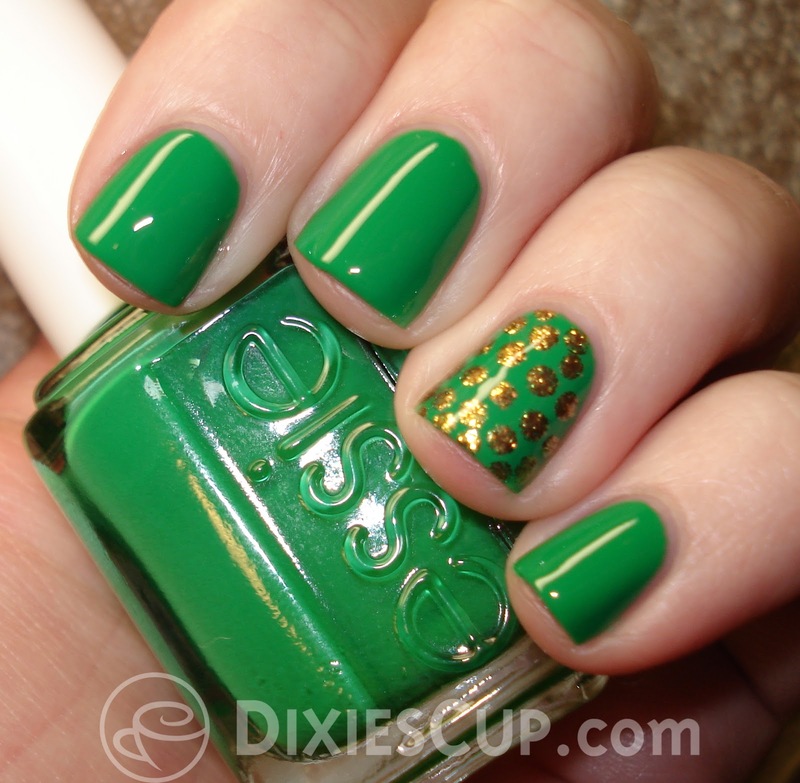 This is Essie Pretty Edgy. SUCH a pretty blue-toned green. I point out the blue-ish tint because I want you to know which photo here is the most accurate. I had a very difficult time getting my camera to show this polish in its true form. The photo below would be the most accurate depiction of Pretty Edgy. The polka dots on the accent nail were done with OPI Goldeneye. The photos show 2 coats of base coat, 2 coats of the color, and 1 coat of top coat. Of course I had to use 2 coats of base coat to protect myself from any unwanted staining. Gotta love those greens. The formula on this was perfect. Buttery smooth and, even with the tiny Essie brush, super easy to apply. No complaints about this polish. I'm so glad I finally own it! I will NEVER own enough green nail polish. Here is a photo taken with the flash. It is the least color accurate, but I still wanted to share it. This is so cute! I haven't seen OPI Goldeneye used this way at all. I'm totally lusting for this polish now! Thanks Rachael! It's funny bc I fully intended to paint my accent nail using Goldeneye and then make the dots using the green polish. However, I got focused while painting my nails with the green and completely forgot until it was too late. :) Accidents sometimes turn out better than the original plan!